We are a Worcester accredited installer and offer up to 10 years warranty on new boilers. We are local, reliable and also a Which? Trusted Trader. Very responsive and keen to ensure the customer is 100% satisfied. Matt and the apprentice were absolutely amazing. Same day service, reliable, clean and left me with confidence. Also thank you to Jane for organising everything. Thank you. On time efficient and most considerate workmanship first class. They all took time to explain the workings of our new Worcester boiler and as pensioner this means a lot to us. Pro Plumb fitted our new boiler 3 years ago and did a superb job. Every year they come back to service the boiler. They are always friendly and do a great job. I wouldn't hesitate to recommend them to anyone! Matt and his team were excellent from start to finish. They took out my old bathroom and completely refitted a new shower room. The complete refurb was installed to a very high standard and the whole job was excellent and very professional. Throughout the job everywhere was sheeted up and the site was left neat and tidy at the end of each day. They all have great personalities and it was a pleasure to have them do the work for me. I would highly recommend them for any job since they are very professional and know their stuff. 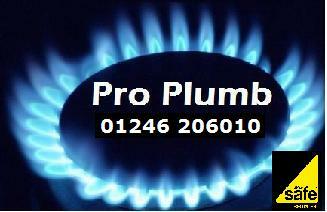 Pro Plumb fitted our boiler in 2009 and ever since we have had them to maintain it annually. They are highly efficient and value for money. I would recommend them to anyone. Thank you Pro Plumb. Punctual, polite and extremely competent. Coped brilliant with removal of a 50+ year old back boiler and adaption of the arch. Pipework to accept the new combi boiler. Recently had a bath removed and a double shower and screen installed with grab rails and pull down seat. Pro Plumb did a fabulous job, as usual. We have used them for various jobs and they always service our gas fire and combi-boiler. The guys are fabulous. My husband and I are older and not very mobile, and we use Pro Plumb because they are hard workers, honest and do very good work. They are lovely and nothing it too much trouble and we always feel comfortable with them. Would always recommend them and regularly use them. Their prices are very reasonable and they never overcharge or add on work like some firms do. Well done guys and thank you do much for the shower - we love it. Had new boiler system fitted. Pro Plumb did excellent work. Matt & Luke are very professional no mess at all. Took time to explain & show how new boiler worked. I would highly recommend these guys & would employ again without hesitation. Pro Plumb fitted a new combi boiler to replace an old system which entailed a fair degree of work and re-piping. This was carried out to a high standard and throughout the job everything was kept clean and tidy. They are very professional and obviously have wide experience and I would recommend them for any size of job. Fabulous work, full back boiler removal and combi boiler fitted, radiator replaced and gas fire installed. Great company, lovely employees and great price. Their work is wonderful and I would highly recommend them. I have also used them for yearly servicing work and other jobs and will continue to use them. Can't recommend highly enough - very thorough and great job. Amazing results from Pro Plumb. Matt and his team do such an amazing job. They are extremely friendly and polite but more importantly very knowledgeable and provide sound, personalised advice. They are really tidy whilst carrying out the work and leave everything spick and span afterwards. The products they use are of really high quality and at all stages explained what they were doing and how everything works. The costs are value for money and you definitely get more than you pay for with their professionalism and knowledge. I am very happy with the results and wouldn't hesitate to contact them in the future or recommend to friends and family. Thank you to Matt and the ProPlumb team for your service. Excellent service provided by Pro Plumb, they were professional, carried out quality work and were tidy. No mess left at all after a new boiler installation. They arrived on time and were friendly and very knowledgeable. Highly recommend them for excellent customer service, quality work and efficiency. Excellent service, a professional job well carried out. Would recommend. We would highly recommend Pro Plumb. Professional, tidy, reliable and above all, trustworthy. Mat and Luke are very helpful and friendly guys. Very good job plain sailing kept things tidy and got on with the job, very pleased. A very efficient and friendly service. They came and did the job without any problems whatsoever. I'm very happy with the price and the service I received. Professional, pleasant, competitive price. Matthew, Willie and Sam were hard working and had a 'can do; attitude which was very refreshing - I would not hesitate to recommend them. Thank you! Excellent customer service and workmanship. Highly recommended fast efficient service. Always left very clean and tidy, very impressed. Certainly use them again. Very helpful and friendly and very professional. Thanks Matt and team. Excellent service, even supplied fan heaters if required. Would recommend Pro Plumb. Matt and his team came in with a professional, friendly can-do attitude. They sorted their schedule around to fit us in ASAP (our boiler broke in the middle of winter). The results are outstanding. Very happy we went with Pro Plumb. Excellent - very professional at all stages. Best quote of of three. Admin were 10/10/ Tools were 10/10. Commissioning was 10.10. Time quoted to do the job 7 out of 10, delay probably because of high demand. Very pleased with overall cleanliness & very pleasant to talk to & trustworthy. Professional from start to finish. Reliable, tidy trustworthy and very pleased with the quality of the work. Highly recommended and will be happy to use them again. Did an excellent job. We will definitely use them again and recommend them. I have used Proplumb over the last five years and found them very helpful and friendly. They have always been on time and were very professional. Highly satisfied, trustworthy, hardworking, clean and tidy workers. Pro Plumb were efficient pleasant & friendly answered any questions very clean and tidy workers and prompt came when they said they would. From initial enquiry to the signing off of our project, we feel we have used the most competent and trustworthy tradespeople possible. Matt and his team are professional, courteous and knowledgeable - we definitely felt we, and our home, were in safe hands throughout. Matt is very clued up, an experienced heating engineer who gave us informed options to help us make the right choice for our new heating system. Matt and the team worked tirelessly throughout the project, worked later and starting earlier than planned to get the job done. We have already recommended Pro Plumb to friends and family and will continue to do so. Pro Plumb team came to my house and fitted heating system and they left my house in a condition I would like to find it. Thanks Matt and his team. Excellent and trusted workmen and very clean. Pro-Plumb the very best! They did an excellent job. Very friendly and polite. Left everything clean and tidy. Would recommend them. Would use them again if required. Very efficient. Everything worked perfectly. Brilliant worker professional and honest. Would recommend them to anyone. I was very impressed with the high level of service provided by Pro Plumb. Mathew and Luke were professional, friendly, helpful and reliable. Their work is completed to a very high standard with complete customer satisfaction. Highly recommended! Pro Plumb's professionalism is of a high standard and it was most reassuring to see their concern to protect their working environment from residual damage - very careful workers. They adhered to the quote in every respect. I was entirely comfortable in having Pro Plumb in my home over a three-day period. This is an important factor to a woman living on her own. Highly recommend Pro Plumb. Very quick and responsive. Will always use again. Brilliant work thank you.